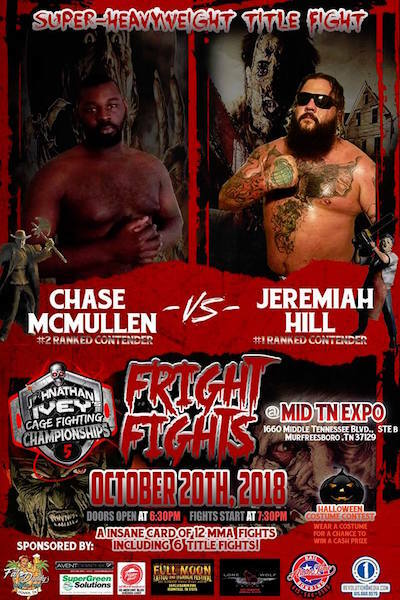 The vacant Super Heavyweight Title will be on the line at Johnathan Ivey’s Cage Fighting Championships 5 on Oct. 20 in Murfreesboro, Tenn., as No. 2 contender Chase McMullen returns to the cage against No. 1 contender Jeremiah Hill. Chase scored a second-round TKO over Lavelle Miller at JICFC 1 in March 2017. He returned at JICFC in February of this year to challenge for the heavyweight title but things didn’t go his way that night. Now Chase is back to fight for the Super Heavyweight strap and spoke with us before the fight. Can you walk us through your fight with Lavelle Miller from back at JICFC 1? He was a big guy and a great Brazilian jiu-jitsu practitioner so I knew I didn’t want to get on the ground with him so I kept it on our feet until I put him away. We’ve heard you were actually winning the fight against JICFC heavyweight champion Sammy Walker before getting caught with a huge punch, what were you able to take away from that fight? Stay humble and keep your head in the fight until it’s over. Have you got a chance to watch the fight with Lavelle Miller and Jeremiah Hill? No, been having trouble finding it. Having fought Lavelle already, what did you think of Jeremiah’s performance? Not sure, but having fought Lavelle I’m not going to lean towards the grappling as much as I believe he did in that fight. Like I said in other interviews I see my speed being the determining factor of me getting this victory. Who are some of the people helping you train for this fight? I’ve got a few spar partners that live nearby that have been helping me out. Is there anybody else in the JICFC that you would like to fight? Just the next top competitor. What are your long term goals in the sport? I would like to go pro and make this a career that’s my long-term goal. Shout out to Yonah and team Bushido, and a big shout out to my friends and family for all their support.